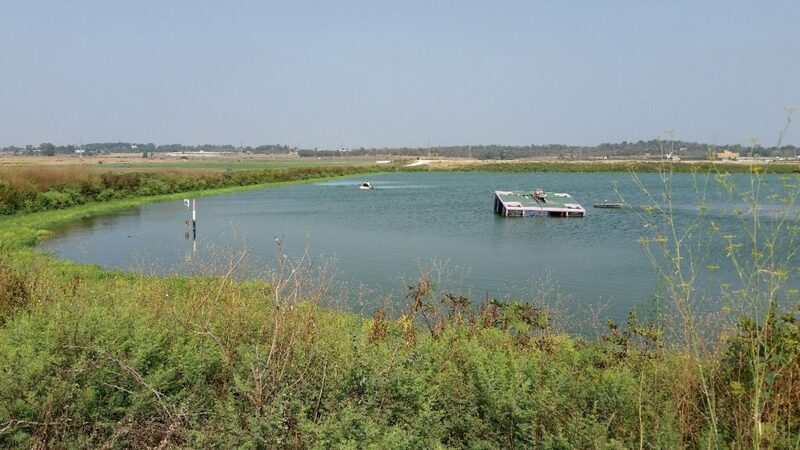 Wastewater Treatment Pond, Kibbutz Givat-Brener, Israel - BlueGreen Water Technologies Ltd.
A waste water pond with 60,000 m2 water-surface (Fig. 1) was heavily infested with a cyanobacterial bloom. The water was treated with 250 kg Lake Guard WhiteTM (85% w/w NaDCC based formulation). The reservoir’s average depth is 15 m.
Fig. 1. A photograph taken from the northern bank of the reservoir. Particles of the Lake Guard White™ can be seen behind the boat from which it was deployed manually. Measurements taken at the water surface indicated a massive bloom of Microcystis sp. with a dense scum accumulating at the reservoir’s perimeter between thick vegetation. Water filter clogging measurements at the water surface (using a 33 µm filter) lasted 0-1 seconds. A previous treatment, 2 days earlier, with copper sulfate at 1 g/m2 (total of 60 kg) did not affect the water quality. Before the treatment started, it was important to establish a sampling method that could provide consistent readings. Therefore, it was decided to sample the water from the intake point that pumps water from the middle of the reservoir at 1.5 meters depth. – Phycocyanin concentrations (as a proxy for cyanobacteria) – 8.23 µg/l (Fig. 2B). – Dissolved oxygen (DO) was 144% (Fig. 2C). – Water pH was 9.13 (Fig. 2D). – Filter clogging time (at 1.5 m depth), which represents the overall water quality, was 28.25 sec (Fig. 2E). A treatment of 250 kg Lake Guard WhiteTM (slow-releasing, floating sodium dichloroisocyanurate granules) was deployed from a boat at the eastern side of the reservoir, enabling the wind to carry the floating particles across the reservoir. The process was done from a boat since the water could not be reached from the shore due to thick grass that grew at a perimeter of 2-3 m around the reservoir. The whole process took 40 minutes by one operator. Although we usually re-sample the water 24 hours post-treatment, in this case, a dramatic improvement to the water quality was immediately observed when the automatic backwash-filter system started decreasing the interval of its activity from every 10 min to every 30 min. As a result, the water was sampled again ~90 min after the time of treatment. – Phycocyanin levels decreased by 96% (Fig 2B). – Dissolved oxygen dropped by 44% (Fig. 2C), indicating a decrease in the total phytoplankton activity and reduction of its overall physiology, as also explained the decrease in pH levels from pH 9.13 to pH 8.85 (Fig. 2D). – Filter clogging time substantially increased by 344% to 1:37 min (Fig. 2E). – Free-chlorine measurements were below detection levels (of 0.01 ppm) both before as well as after the treatment. – No significant changes were detected in terms of temperature or specific-conductivity in the water. Fig. 2. Change of the averaged A) chlorophyll-a, (B) phycocyanin levels, (C) dissolved oxygen (DO), (D) pH, (E) filter clogging time. Bars represent standard deviation. In line with previous applications of the Lake Guard™, it was demonstrated once again that the accumulative effect of a well-concentrated algaecide (both vertically as well as spatially) is far greater than the theoretical potential of the total active ingredient that may otherwise be applied in the water. Specifically, this application demonstrated once again (e.g. here, here and here) the rapid and dramatic effect of the chlorine-based algaecide on cases of massive cyanobacterial blooms and the advantages that can be drawn from an educated tactical deployment of different combinations of the Lake Guard™ products in response to the ad-hoc conditions in the waterbody.